Episode 11 of the series of conversations with men who stutter features Frank Stechel, who hails from Highland Park, New Jersey. Frank worked for the New York State Education Department for over 30 years, in the vocational rehabilitation field. Frank felt it was practical for him to work in the disability field, as he was concerned that he might not find work due to his stuttering. He felt it made sense to work for an agency that helped people with disabilities as they wouldn’t discriminate against him. 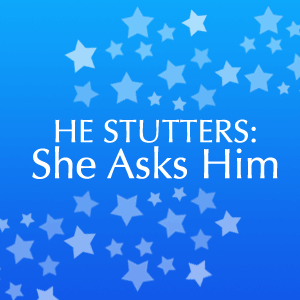 We talk about being open about stuttering, and how Frank always would bring it up and invite questions during job interviews. Being open has always been most important to Frank. Listen in as we discuss different speech therapy experiences, including the Hollins fluency shaping program. Frank uses fluency shaping tools he learned to modify his stuttering. We also discuss the variability of stuttering and how he often plays with different techniques to this day. I look forward to meeting Frank and his wife at the National Stuttering Association conference in July of this year. Feel free to leave comments and feedback for Frank, or just thank him for sharing his story. 2 Responses to "Not His Fault – Male Episode 11"
What another great interview. This time I took notes and would like to comment on a few things. Frank mentioned a few things about his speech that mirrors my train of thoughts. One was his openness about his speech and the job interviews he went on where he decided the best approach was to let the cat out of the bag and inform everyone he indeed had a stutter. 2nd thing is the therapy he had as a child; seem to again mirror my thoughts on how hard it was for us older people who did not have things like the NSA and SLP’s of today. Speech therapy was so bad back in the day. A 3rd and final thought was that Frank has a great attitude about his speech and never seem to play the VICTIM role and to not let his stutter hold him back. I noticed he also thought stuttering was a disability as do I. With that said, his attitude played a major role in his success in life.. Good job again to both you and Frank. Frank is a good guy. Had the pleasure of meeting him once over lunch. Thanks for posting Pam and for all the good work you do!